While most of us may never encounter a feral hog, some might say they are extremely tasty, while others might say they are a nuisance. They are found near wetland areas such as rivers, creeks, and drainages and will concentrate in areas of food availability. They can cause significant damage to agricultural crops because of rooting and trampling. Reaching weights up to 400 pounds, these beasts create a challenge for livestock and wildlife species when competing for food. Fortunately, Kansas’ populations are low due to our aggressive eradicating methods. The hogs are much more prominent in Oklahoma and Texas. Wild hogs carry many diseases including tuberculosis and anthrax. They also attract dog ticks, fleas and hog lice. Their razor sharp tusks combined with their power and speed can cause death or serious injury. According to Sarah Alsager, public information officer with the Missouri Department of Agriculture, feral swine are routinely tested for pseudorabies and brucellosis. These are potentially fatal diseases of the central nervous system that causes convulsions and intense itching. These diseases can affect humans as well as livestock and wildlife. 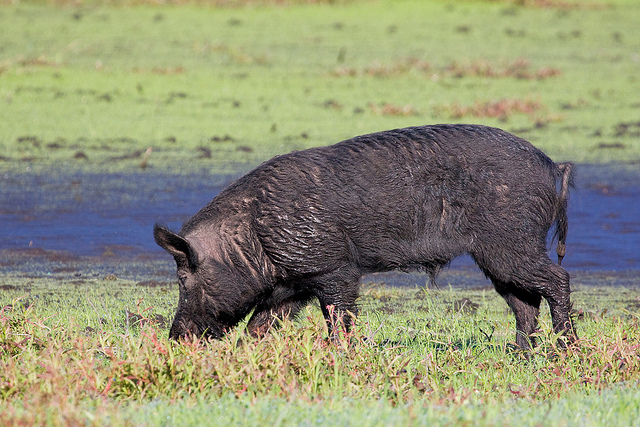 Recently, a positive result for pseudorabies was discovered when testing feral hogs in an area of Callaway County in Mid-Missouri. An at-risk swine herd in the area also tested positive for the disease which resulted in euthanizing 100 pigs. Although a farmer receives payment based on the current market, nobody wants to endure this trouble. Current steps are being taken to control feral hogs. If you should spot wild hogs, you are encouraged to contact The Department of Conservation in your area.